We’re ready to launch Mount Grant trail construction and welcome any trail blazers interested in helping! Starting October 6th, we’ll meet Saturdays (10/6, 10/13, 10/20) and Wednesdays (10/10, 10/17, 10/24) working from 10am to 2pm. 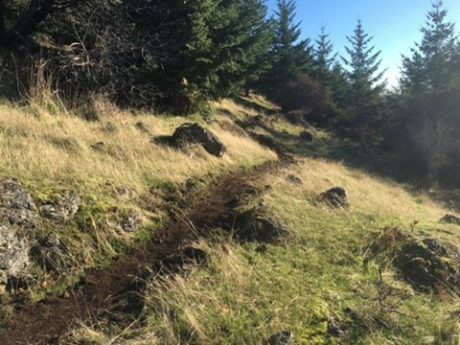 Trail construction will involve brushing, limbing, and transplating vegetation; moving rocks, timbers, and brush piles; and grubbing/grading trail surfaces. We’ll meet and park in the vicinity of the lower road junction, where you would take a left to get to the current “non-motorized” route to the top. Please bring your own gloves, sturdy boots, and eye protection. We will have some tools available, but if feel free to bring your own (handsaws, pruners, grub hoes, pick adze, McClouds, etc.) if you prefer! RSVP to Tanja (tanjaw@sjclandbank.org) or call 360.378.4402 for more information.